What type of hot sause do u love? What is the best thing to put hot sauce on? Do आप think टैको, टैको, taco घंटी, बेल sauces is hot sauces not that if it is या not hot? Ok I am shamefully promoting this sauce cuse well I प्यार it and people need to know about it. I use it on chicken, salad, sandwiches, pork, potato's and white मछली mainly. They have some recipes on there site that are pretty good to. Very Hot! - A fiery combination of black peppers, red chili peppers and jalapeno peppers. a comment was made to the poll: What type of hot sause do u love? 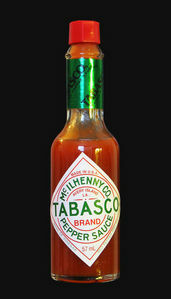 All of these are ingredients in McIlhenny's Tabasco sauce except one. Which one doesn't belong? Best commercial hot sauce you've tried?